Some say we are witnessing a ‘lithium-ion revolution’, a global transformation in the way we store and use energy with innovators like the Tesla’s of the world leading the charge. Market indicators suggest a deep supply shortage and rapidly growing demand profile for lithium and cobalt fuelled by a burgeoning lithium-ion battery market. Savvy investors, exploration companies and strategic off-takers alike are increasingly turning their gaze towards Canada’s premier mining jurisdictions of Quebec and Ontario in the hope of capitalising on their high-grade lithium and cobalt endowment. With companies like Nemaska Lithium already proving that social and environmental licences can be obtained on its hard rock lithium project, Australian explorer MetalsTech is determined to take its high grade discovery at its Cancet Lithium Project through to production. MetalsTech is focused on exploring for lithium and cobalt, both key inputs in the manufacture of lithium-ion batteries. The company plans to start drilling at its Bay Lake high grade cobalt in the next few months on the back of outstanding historical exploration results which include several hits of over 15% cobalt in historical mine workings close to surface. While Bay Lake is at the early stages of development, the project is located in a seasoned mining jurisdiction and infrastructure is excellent. For a commodity where anything >0.5% cobalt is considered high grade, Bay Lake has real potential. MetalsTech’s Cancet Lithium Project boasts similar high grade characteristics, however it is more advanced and is de-risking at a rapid pace. It is in good company with neighbouring hard rock lithium projects like Nemaksa’s Whabouchi deposit, Critical Elements’ Rose deposit and Galaxy Resources’ James Bay deposit all garnering strong industry attention with their owners boasting a combined market capitalisation of A$1.3 billion against MetalsTech’s modest A$15m. Out of the stable of the company’s assets, Cancet rose to the top after recent drilling results showed some key differentiators; the project boasted the highest lithium grades ever encountered within Quebec, and the spodumene dominated pegmatite ore body started from surface. These factors combined with Cancet’s ideal location being immediately adjacent to a major highway and Quebec-hydro power line, suggested world class potential. By comparison, many well-regarded peer projects in Australia and Canada struggle with the depth of their deposits, with many starting at more than 50-100m from surface. Cancet has demonstrated strong pedigree early on in exploration with recent drill hits including 5m @ 4.10% Li2O and 114 ppm Ta2O5 from 12m depth and 8m @ 3.59% Li2O and 489 ppm Ta2O5 from 18m depth. High grade ore at surface will aid MetalsTech tremendously with its vision to deliver a low cost mine at Cancet. Chairman Russell Moran and fellow Director Gino D’Anna targeted Canada specifically due to its abundance of low cost infrastructure, including an extensive rail and road network and very cheap hydro-power; all the key ingredients for a robust and profitable mining operation. Cancet is located a few kilometres from a Quebec Hydro substation, providing access to some of the cheapest power globally and only a few hundred metres from a major highway which connects the project to a vast skilled labour and service provider network. “We are not in the business of building infrastructure. We want our money to go into the project and be able to deliver that project with the best possible return on equity,” explains Moran. While permitting a new mine has its challenges, Nemaska has already broken ground in this area having established a positive precedent with the Cree Nations – the same group that MetalsTech is working with at Cancet. Nemaska has secured social and environmental licences for its large scale hard rock lithium mine and Moran considers their good working relationship with the Cree as a validation and a significant de-risk for the path to permitting, financing and ultimately commissioning of a mine at Cancet. In terms of how to monetise its lithium deposit at Cancet, MetalsTech has three options. One option would be to contract mine and sell its high grade raw ore at surface on a DSO basis (direct shipping ore), an accelerated strategy involving minimal CAPEX. The second would be to install a concentrator at the mine site taking advantage of the nearby low cost power, and produce a modest 200,000-300,000 tpa of battery grade spodumene concentrate (>6% Li2O). Recent metallurgical test work suggests that the lithium in the Cancet ore can be liberated efficiently using simple dense media gravity separation (DMS). This type of operation may cost less than US$100 million and conceptually if MetalsTech can produce its concentrate at <US$350 per tonne (t) and sell at >US$650/t, that could equate to US$60-90m in free cashflows annually. Moran notes that ASX-listed Tawana Resources which boasts similar mineralogy at their Bald Hill Mine recently secured offtake contracts for US$880/t for a 6% Li2O concentrate. The third option, which would require significant investment, would be to build a beneficiation plant to process the spodumene concentrate and produce lithium chemicals such as lithium carbonate or lithium hydroxide. This is the path that Nemaska has taken and Moran highlights that to preserve optionality, MetalsTech has secured an exclusive licence to use SileachTM within Quebec, a lithium extraction technology patented by Lithium Australia which could be employed as an alternative to traditional processing methods. “We are fortunate to have flexibility and potential to stage our business. Ultimately decisions are made to maximise shareholder returns,” explains Moran. “The metallurgy and mineralogy of a lithium deposit is one of the most important drivers of value,” highlights Moran. Recent metallurgical testing shows the Cancet ore performs very well when crushed for lithium liberation. Extraction rates of 77% lithium were achieved with a 13% mass yield for a 6.24% Li2O concentrate, >6% Li2O being the benchmark to meet battery grade. It was efficiently liberated at a 10mm crush using DMS. These results suggest a highly marketable coarse grain premium concentrate could be produced with simple and low cost processing. Moran adds that testing occurred on sample ore that is now considered to significantly underestimate the grade of the deposit so there is still further upside in mass yield and concentrate grade. “We believe we have something special at Cancet,” beams Moran. 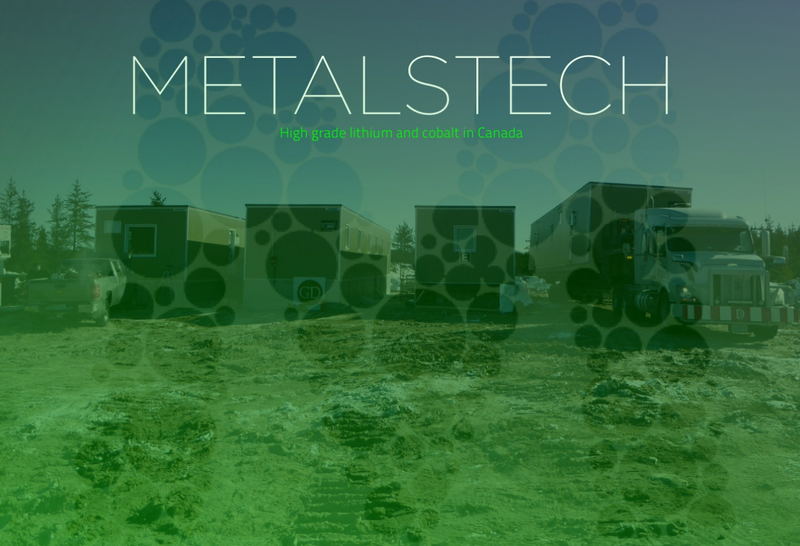 The renewable energy market is going through a transformational change and explorers like MetalsTech are looking to fast-track development of their battery mineral projects and take advantage of the surge in interest. Global powerhouses like Tesla, BMW and Volkswagen are all looking to grow their production of electric vehicles, which in turn drives demand for lithium and cobalt as key inputs in lithium-ion battery production. There is consensus among experts that the demand for lithium-ion batteries is expected to grow dramatically over the next 10 years. They are widely used in the portable device sector which includes smartphones, laptops, tablets and digital cameras. Adoption within the growing recreational and commercial electric vehicle market is also a key area however Moran insists that their use in mass energy storage initiatives deserves particular excitement. They have the ability to turn every home into a means of efficient energy capture and storage. Tesla has been quick to market with its Powerwall energy storage unit and similar products are expected to come on stream over the next few years. A compounding factor sure to ensure strong commodity pricing is an anticipated supply side deficit due to delays in the commissioning of new lithium mines or mine expansions. “On the supply side, I don’t think the industry can respond fast enough. It is not easy to bring a mine into production, there are always delays, even when commissioning expansions,” Moran observes. MetalsTech believes there is an opportunity to secure early strategic financing. Generally speaking, strategic investors won’t usually take a position in a project until at least the PFS stage, however with supply expected to become tighter, chemical traders and battery manufacturers are looking to minimise risk and shore up their supply chains where possible and that may mean investing at an early stage in return for offtake rights or project interest. “Supplier concentration is a huge risk for any business. Diversification is the only way to alleviate this risk and that is where MetalsTech as a new entrant operating in a low risk jurisdiction can play a role,” explains Moran. Armed with a representative ore profile and product specification, MetalsTech believes it will attract competitive tension for its offtake. Representative testing on composite drill core is already underway with results expected over the next six weeks. These results together with phase II drilling, delivery of a maiden resource and scoping study will be major catalysts for the company over the next six months. “We are seeing some panic among end users and investors to secure lithium exposure now. There certainly seems to be a window for projects to deal on attractive terms even at an early stage, both for offtake and on the M&A front. High grade deposits that are close to surface are rare, so we are confident Cancet will stand out,” asserts Moran. With clean tech funds, as well as strategic investors and conventional resource institutions turning their attention to the battery sector there is likely to be a deluge of new capital flowing into lithium and cobalt projects. For Moran, making sure MetalsTech hits all its key deliverables over the next six months will be critical in positioning the company to capitalise on the buoyant market.